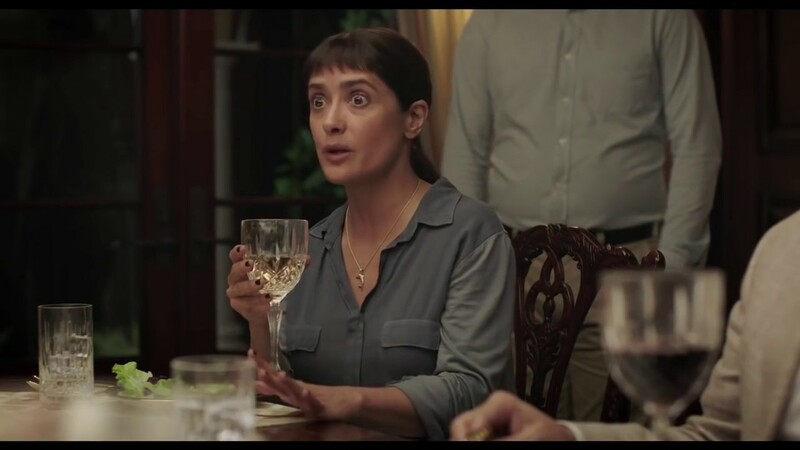 Photo from the film Beatriz At Dinner. If you wonder how in the world Donald Trump, a multi-billionaire, won because of his support from white rural people who have a difficult time making ends meet, go see “Beatriz.” But rather than get an answer to this riddle, you’ll be even more dumbfounded, because the fictional billionaire in Miguel Arteta’s film from Mike White’s screenplay is your basic narcissist who might be on the wavelength of people in his 0.1% circle of Americans but could hardly win the vote of the down-and-out. The team of Arteta and White, whose “Chuck and Buck” made 17 years ago focuses on a man-child who stalks his childhood best friend looking to reconnect, this time train their creative impulses into a less zany film that could be liked by a larger audience. It helps mightily that the title character, Beatriz, is played by the magnificent Salma Hayek in what just might be her best performance. Her vegetarian character could be a replacement for PETA president Ingrid Newkirk should that wonderful and accomplished leader resign. And here, the conflict is virtually black-and-white, crossing a big game hunter who boasts of killing a peaceful rhinoceros during a South Africa safari with a woman who rightly considers herself a healer, one who loves animals (and probably most people) with such a ferocity that she even keeps a pet goat in her bedroom along with two adorable dogs. Beatriz is a massage therapist who works at an alternate treatment center in L.A., not only manipulating bones but also mystically laying on her hands over her patient’s bodies. She had once treated the daughter of Cathy (Connie Britton) after the young woman’s chemo and serves Cathy as well by carrying her equipment to the most lavish house a single family could imagine. When her car breaks down on her way out, she is invited by Cathy to stay the night because Beatriz is considered almost family, though Cathy’s husband Grant (David Warshofsky) is less than supporting given that he is to conduct a work meeting with his partner, Doug Strutt (John Lithgow). Strutt arrives with his wife (Amy Landecker), meeting the firm’s lawyer Alex (Jay Duplass) accompanied by his spouse (Chloë Sevigny). The house employs a two chefs, a maid, and an entrance watchman. Though Beatriz, who hugs everyone on meeting as a faith healer is wont to do, may have started out as a fish out of water, she intrudes herself into the dinner conversation, sings while accompanying herself on guitar, and, after three glasses of wine gives Doug Strutt hell about his hunting expedition to the shock of the entire household. Nor is Beatriz pleased that Strutt had cleared land in Mexico, throwing out local populations and shafting workers by denying them a minimum wage. Morever Strutt had virtually challenged Beatriz’s citizenship by asking her whether she came over illegally, though what happens during the concluding moments of the film pushes Beatriz’s audacity even further. Maybe writer-directors Arteta and White had Trump in mind when they created this film, but then again, our president is hardly unique. As Balzac had said “Le secret des grandes fortunes sans cause apparente est un crime oublié, parce qu’il a été proprement fait.” “Behind every fortune is a great crime.” Characters played by John Lithgow and Salma Hayak could represent Donald Trump and Bernie Sanders, respectively. They are hardly unique individuals; their conflict lies at the root of our divided American population today. At eight-three minutes, “Beatriz at Dinner” is tightly written with some appropriately prepared mysticism at the conclusion, graced by smart dialogue. This is a theatrical piece that plays quite well on celluloid.